Images: Cape Blanco Lighthouse by Stender Designs. 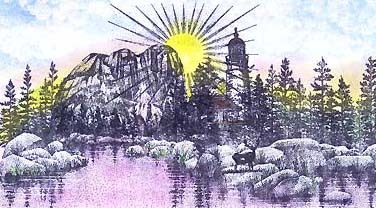 Tall Rock w/Fall 081E, Lakeside Reflections 051G, Lakeside Cove Lg 049G, Luminous Sun 199E, Buck 008A by Stampscapes®. Media: Prisma Colored Pencils, Soft Pastels, and Fixative. Artist's Note: Cape Blanco Lighthouse located in Blanco State Park (Near Port Orford), OR. Built 1875. The First keeper was James Langlois. He remained for 42 years. If traveling on Hwy 101, visit the cape and Port Orford because they are very special in their own right. Images: Cape Blanco Lighthouse by Stender Designs. Tall Rock w/Fall 081E, Lakeside Reflections 051G, Lakeside Cove Lg 049G, Luminous Sun 199E, Buck 008A, Tonal Applicator (Rays) 117E, Cloud (Cumulus) 018E by Stampscapes®. 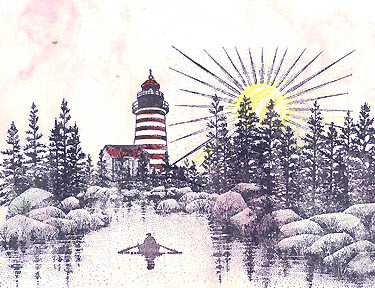 Images: Lighthouse by Hardware Stampin. 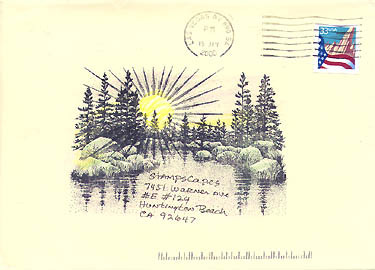 Canoe 010A, Lakeside Cove lg 049G, Cloud Cumulus 018E,Luminous Sun199E by Stampscapes®. Media: Art work done on a smooth white velvet card stock and glued to a blueberry card stock from Ashton Papier. Art work done with Prisma colored pencils and soft pastels. Then sprayed with a fixative. Artist's note: North Carolina the lighthouse kept many a ship from cruising near hazardous diamond shoals. Images: Lighthouse from Repeat Impressions. 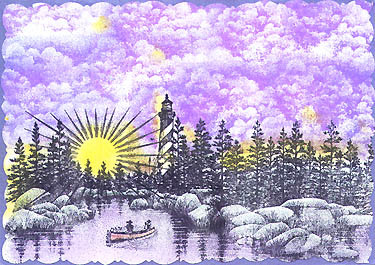 Lakeside Cove 049G, Row Boat 166A and Luminous Sun 199E by Stampscapes®. Media: Card stock is called clouds. Color is rose by Ashton Papier. 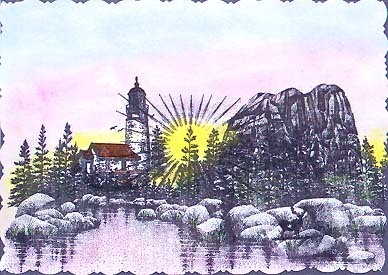 Note: Located in Lubac, Maine in 1806, Thomas Jefferson signed the order to build the light. Built in 1808, it guided ships through the Quoddy narrows between the U.S. And Canada until the year 1858.